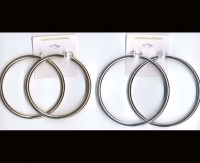 $15/DZ , 3" HOOP DIAMETER THICKER THAN NORMAL EARRINGS. AROUND 5mm. thick. pick gold or silver. we also have a 4" PICTURE ON THE LEFT. THE ONE ON THE RIGHT SIDE IS THE 4"